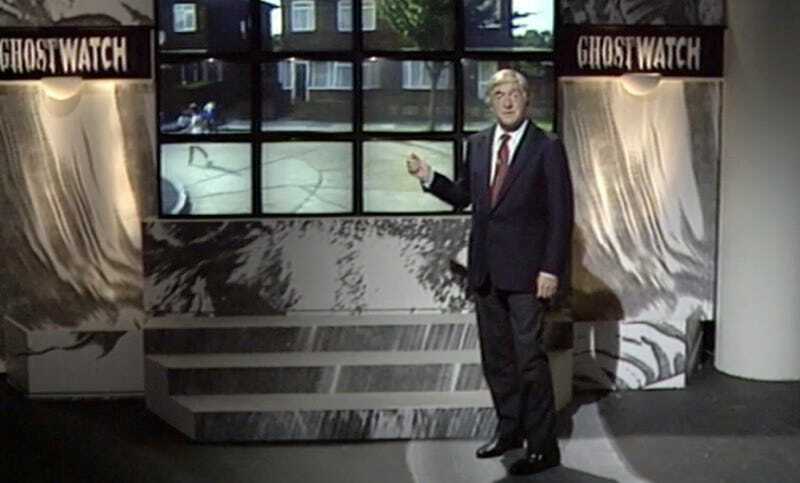 On Halloween 1992, the BBC aired Ghostwatch, a 90-minute special presented as a live, scientific investigation of a haunted house. It was, of course, strictly a faux doc—but it still managed to confuse more than a few viewers who believed they were watching real terrors caught on tape. Confuse—and, in many cases, outright terrify. This was years before The Blair Witch Project and the subsequent explosion of found-footage horror; watching it now, it immediately calls to mind films like Paranormal Activity and The Last Exorcism, among others. (The “case” was inspired by the Enfield Poltergeist, the Amityville-ish haunting that was dramatized in The Conjuring 2.) Ghostwatch further took advantage of its gullible audience by featuring real journalists who “reported” on the unfolding events. In jaded 2017, you can tell it’s a set-up—but it’s still excellently eerie, with strong performances and a look that exactly evokes prime-time TV of the era. Back in 1992, the backlash was instant. Though the BBC actually encouraged viewers to dial in during the show, it ended up fielding tens of thousands of freaked-out phone calls; the program was later blamed for a teenager’s suicide. Despite its headline-grabbing notoriety, it was never shown on TV again, and it took 20 years for it to become available on DVD. Naturally, it developed a huge cult following as a result, but it’s always been difficult to track down in the US—until now. Ghostwatch is now available to view on horror-centric streaming network Shudder, the same channel that recently made another notoriously difficult-to-find film—Ken Russell’s The Devils—available to the masses.